I don't want to sound sexist, but the women I know have better support groups than men. My husband is constantly amazed at "my network". Neighborhood: I walk our dogs. There are several people who regularly walk and jog along my path, plus there are people who I encounter getting in of/out of their cars. Recently, we were looking for a tree-trimmer, and I stopped along my walk to ask a neighbor I'd never met who they used. Gym: I attend the gym at regular days/times. I learned one of our favorite local restaurants is owned by a man I chat with while lifting weights. He gave us free wine recently when he saw us at a table. Car Repair: I bought my car at a dealership 30 miles away. It included free service on regular issues. Free? Yep, I'm taking advantage. When a new dealership opened up near us recently. One of the service managers recognized me and gave me a nice discount to service my son's car. I have other people in my support group: former babysitters for my kids, former students of my husband's, former workers at my local grocery store/bank/accountant, etc. Recently, I had a nasty computer virus and went to a small business that was recommended to me by someone in my network. One of the techs said he knew me. How? I'd helped my dad buy a computer at Staples and he was working the tech department. When the virus returned the next morning, he made a house call - totally awesome! How did I form my support group? By doing something my mom taught me. Looking those who I interact with at any level in the eye and offering a smile, a greeting, a question about their day. Do you have a personal support group? How did you build your network? Melinda Curtis is an award-winning USA Today bestselling author of sweet romance, sweet romantic comedy, and more traditional romances. 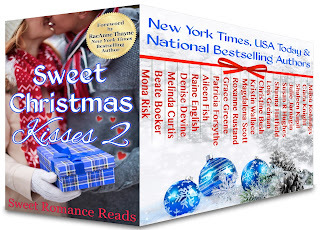 Her latest releases are sweet romantic comedies that can be found in three different holiday collections - all sweet romances, all never-before-published novellas, all 99 cents. I find that being nice to everyone and showing them you're interested in them is how to get people into your sphere of influence. You are right about asking people a question. I learned that firsthand at book signings. If I greet people as they walked by and ask them a question, they usually stop and chat and often buy my books. It's the personal connection that brings people into your circle, if even for only a short time. I forget who made this quote, but someone once said that people won't remember what you said, they'll remember how you made them feel. Wonderful post! It's all about letting people know we "see" them and making those connections, making them feel important. Thanks for the reminder to do this more often! Such a good post and a good reminder of why having 'neighbours' is so important. Imagine our world if we all treated others as we wish to be treated ourselves.